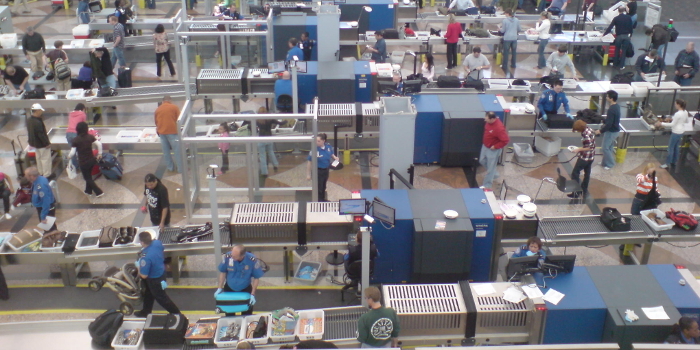 Congressional legislation requires the Transportation Security Administration (TSA) to make its customer service information available to the American public. The data shows the challenges TSA faces, areas for improvement and emerging trends in aviation passenger and cargo screening. Instead of anecdotal information, these data provide a quantitative basis for how well this government agency is doing when it comes to customer service. TSA customer service complaint statistics for October 2017 through December 2017 and select time periods are shown in the following table. Along with these statistics are the number of passengers and the number of bags checked/screened by month. The data are stratified under the following headings: courtesy, screening procedures, processing time, and personal property. Most complaints relate to courtesy, which may be defined as showing politeness in one’s attitude and behavior toward others. The next two categories, in order of number of complaints, are personal property and processing time. Examining monthly data is important, but probing trends in data is probably more so; monthly data may show deviations from a trend. For the 12 months, January through December 2017, TSA screened on average approximately 62 million passengers and 49.1 million pieces of checked baggage. For the same time period, there were 1.29 courtesy complaints per 100,000 passengers. The rate for screening procedures and processing time was considerably less, and the complaint rate for personal property averaged 1.02 complaints per 100,000 pieces of screened baggage. Data for the time period July through December 2017 shows that on average, the agency screened 64.2 million passengers per month and 51.1 million pieces of checked baggage per month. During the second half of 2017, the courtesy complaint rate increased to 1.37 from 1.29. The personal property complaint rate dropped to 0.99 complaints per 100,000 pieces of checked baggage. Most interesting was the fact that for the last three months of 2017, 63 million passengers and 50 million pieces of checked baggage were screened each month. This was lower than for the six-month period between July and December 2017. However, while the personal property complaint rate was nearly the same for the last three months of 2017 versus all 2017 (1.01 versus 1.02), the courtesy complaint rate was higher for this three-month period than all of 2017 (1.42 versus 1.29). The processing time complaint rate, while slightly higher (0.24 versus 0.14), was almost double compared to all of 2017. The reasons for changing trends in customer complaints are many and complex. While determining causes for changing rates of complaints is important for TSA to improve its operation, these data are independently important because they can offer timely and revealing insights we are unlikely to uncover in other ways. Industry bodies, legislators, regulators, airlines and airports, and even the traveling public all have a stake in how TSA performs when accomplishing its aviation security mission. Fortunately, thanks to this publicly available data, we don’t have to guess at how TSA is performing. It’s all in the numbers.